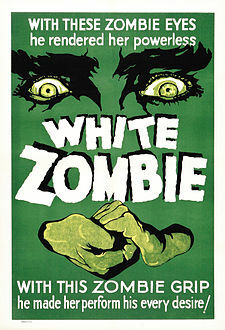 The 1932 film White Zombie is considered the first feature-length zombie film in the history of cinema. Unfortunately, the film is also one of the primary examples of how American pop culture has appropriated various religious beliefs (particularly those of non-white cultures) for shock value or entertainment purposes. The film’s antagonist is a Haitian “voodoo master,” played by Bela Lugosi, who uses zombies as manual labor and uses a potion to turn the protagonist’s fiance into a zombie. The character’s exoticism (by Hollywood standards) began a large push towards commercializing Voodoo in the 1930s, despite the fact that it is an honest-to-goodness religion spawning from West Africa and Haiti, and being dispersed in the African diaspora through slave trade. The effects were most immediately felt in Louisiana, where the religion had thrived in part because of the overwhelming number of African slaves in comparison to the tiny number of white slave owners. The result of producing pop culture about Voodoo meant that Haitian Voodoo and the West African Vodun that flourished in Louisiana were conflated into a single entity simply called “voodoo.” During the 1930s, the religion’s diversity was essentially boiled down to potions, powders, and the ever-present voodoo doll; the real rituals and spiritual beliefs, meanwhile, were forced underground and away from the public eye. Structurally speaking, “Voodoo” is a sound episode of So Weird. If one were to apply Aristotle’s Six Key Elements of Drama to the script, on the surface level no major problems would emerge. It’s even a good continuation of the show’s attempts to build Annie as a real character, as well as to give her a chance to share experiences with Molly in order to better forge their mother/adopted-daughter relationship. And the show succeeds at its bait-and-switch in part because Sally, Annie’s Jamaican friend whom she visits when Molly comes to Louisiana to play a gig for a scholarship for Sally’s older brother to go to medical school, is like Annie in that both have changed since they were younger. The scenes the two share have the tinge of nostalgia, of people growing older and growing apart, and so the effect of Sally being behind the manipulations of Molly and Annie is only slightly tempered by the wacky conclusion of Clu catching the voodoo doll before it hits the ground. “Voodoo” is more-or-less So Weird operating on a solid level, particularly noticeable now that the show is finally on the road again instead of kicking around that atrociously-colored high school. But the episode itself contributes to the stereotyping of Voodoo as simply “black magic” and not an actual religion with its own system of spiritual belief. Olivia Grange, the “voodoo lady” of the episode, gets almost no characterization beyond the ambiguously menacing glares of actress Judith Maxie, and despite the episode’s attempts to remind the viewers that “there’s good voodoo and bad voodoo” (which is really a simplification of the truth, that voodoo dolls are actually used as blessings and not curses), “Voodoo” undeniably depicts Voodoo as an evil form of magic, not unlike White Zombie‘s depiction nearly seventy years prior to the airing of this episode. Disney, of course, is no stranger to this particular depiction of Voodoo (or of cultural appropriation); the antagonist of The Princess and the Frog may as well be a long-lost descendant of the antagonist of White Zombie. But it’s disappointing to see Annie, a character whose world travels would obviously make her a prime candidate for being more sensitive to these type of appropriation issues, be so willing to give into the cultural stereotypes of Voodoo. The fact that she is rendered passive by the episode (as both her and Molly’s hair are used for the voodoo doll) only further derails giving the character an honest impact in the wake of Fi’s absence. It’s hard to be disappointed in an episode of So Weird when the show was previously so fully committed to tackling science fiction and spirituality through the lens of Fi’s cultural background. But if the color of Annie’s stories is to be more “worldly” in comparison to Fi’s predominantly Irish mythology, then the show has to do better than “Voodoo” if it wants to succeed in making the loss of Fi as a main character more digestible. Cameron White is a freelance writer currently residing in Arkansas. He writes about television over on his blog, Wayward Television, and tweets about Herbert Love, the riff-raffing swift-slapping talk-talking politician who supports building George W. Bush’s wall or something. His obsession with television was founded in 1996 by The Disney Channel and fostered by his discovery of Firefly in the summer of 2007. He does not have Level 7 clearance.